Intragaz’s activities are focused on underground storage. We operate the only two storage sites in depleted reservoir in Quebec. The experience aquired by Intragaz over the last three decades allowed us to develop a great knowledge of the subsurface in Quebec and its operations. 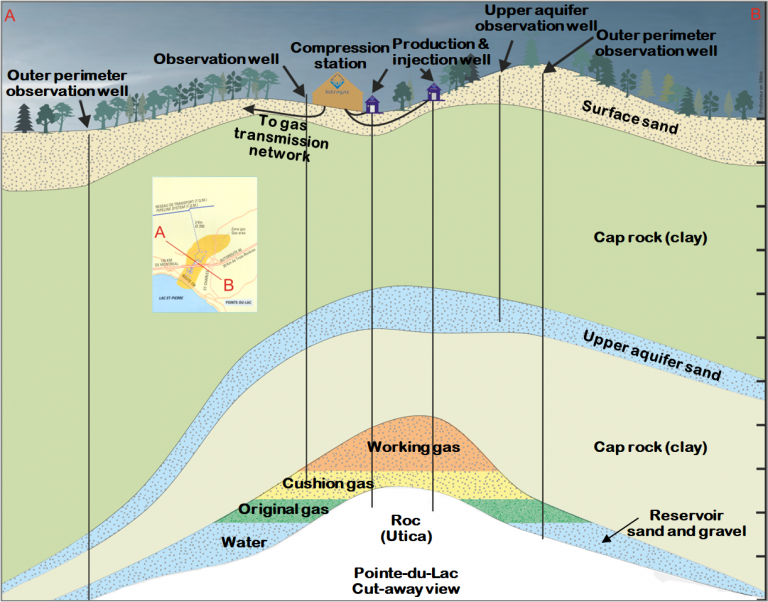 Intragaz successfully converted the only two depleted natural gas reservoirs in Quebec. These reservoirs are located in two very different geological horizons: a very shallow site in the Pointe-du-Lac sector near Trois-Rivières, and a very deep site in Saint-Flavien on the south shore near Quebec City. The Pointe-du-Lac reservoir is located approximately 100 km northeast of Montreal on the north shore of the St. Lawrence River, 12 km west of Trois-Rivières. The reservoir is oval shaped with the long axis oriented NE/SW. This depleted gas reservoir in an aquifer is primarily used for peak shaving. It is connected to the TQM Pipeline transportation system located 3 km north of the compressor station. The reservoir is composed of unconsolidated sand deposited after the next-to-last glaciation approximately 120,000 years ago. Its thickness ranges from several meters to more than 10 meters, and it is only 60 to 120 meters deep. The structure was created by the presence of a structural elevation in geological basement formations covered by glaciofluvial sand deposits with an impermeable clay layer serving as cap rock. The exceptionally high permeability and porosity of the sand makes the storage site ideal for peak shaving. Thanks to the reservoir’s injection and withdrawal capacity, the working capacity can be cycled up to almost four times a year. It is recognized as one of the most shallow storage sites in operation. Its natural low pressure means that during withdrawal high compression is required in order to be able to inject into the gas network. The following cut-away view shows the current Pointe-du-Lac site. Due to its injection and withdrawal capacities, the site is used mainly for meeting the winter peak but can also be used for seasonal volumes. The following table shows the site’s specifications. Because of a shallow storage area (approx. 70 m), pressure in the reservoir is low (740 to 250 kPa) and in particular much lower than the operating pressure of the pipeline it is connected to (7,000 kPa). This means that, unlike most of the world’s storage sites, the gas must be compressed during withdrawal and, conversely, pressure must be reduced prior to injection into the reservoir. Injection begins with gas filtration and reheating. Next, the gas is initially decompressed to 1,500 kPa to feed the gathering system, and then decompressed a second time at each well prior to injection into the deposit. The free water generated during withdrawal is separated from the gas by a separation module at each well. The wet gas from the wells is transferred to the compressor station via three compressor units, then dehydrated for transport through the gas system. The Saint-Flavien storage site, commissioned in 1998, is located 40 km southwest of Quebec City near Laurier-Station, some 10 km south of Highway 20. The Saint-Flavien reservoir is located at a depth of around 1,500 meters in a geological zone that was overthrust when the Appalachians were formed some 440 million years ago during Taconian orogeny. It is composed of dolomite that formed around 470 million years ago and is part of the Beekmantown formation. It is covered by nonporous carbonate, which serves as cap rock. The reservoir’s thickness ranges from 1 to 8 meters, with porosity ranging from 2.5 % to over 10 % but on average between 3 % and 5 %. The porosity is of secondary origin, which means that preexisting porosity was improved by way of hydrothermal fluids and fracturing. 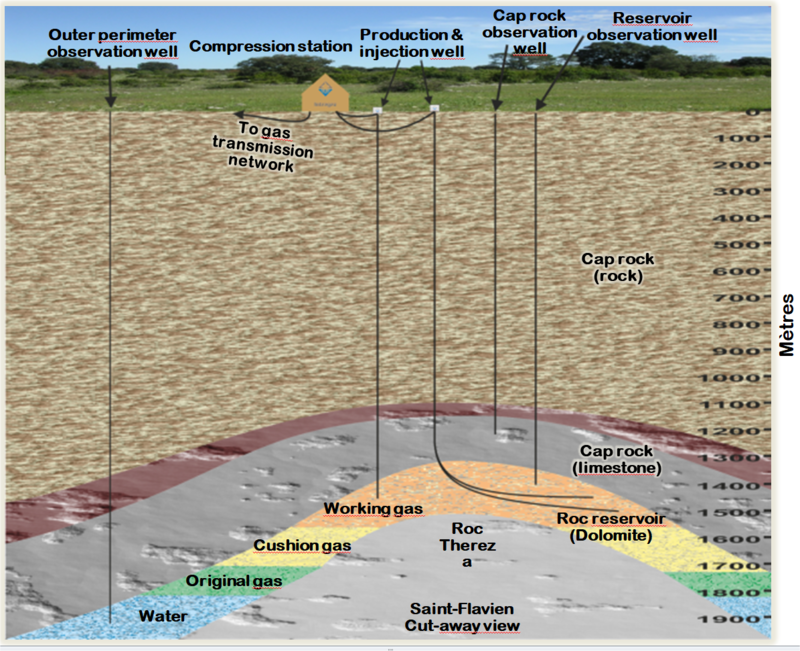 As shown, vertical and horizontal drilling of the geological structure is clearly visible at the Saint-Flavien site. The Saint-Flavien site provides seasonal storage with a very good peak shaving capacity. The site’s storage size allows it to support elevated withdrawal rates over long periods. The following table shows the site’s specifications. During injection, gas coming from the TQM Pipeline is first filtered and compressed before being transferred to the wells by a gathering system. At each well, the gas is measured and injected into the reservoir. During withdrawal, the pressure differential between the reservoir and gas pipeline moves the gas out of each well. A methanol injection system located at the wells prevents hydrates from forming in the gas pipe. The gas is then transferred over the same gathering system, heated, decompressed to the required pressure, and dehydrated prior to reentering the pipeline tying the site to the TQM Pipeline system. Compression is used for about 60 days during withdrawal season.